Reserved as the last game of the season, this year’s ‘Sunshine Showdown’ between the Florida Gators and Florida State Seminoles is garnering average ticket prices of $197. These in-state rivals are still pulling exceptional ticket demand despite being unranked and in different conferences. This is the second-highest ticket price for any Florida State game this season, the higher priced event being an early meeting with the Oklahoma Sooners ($215). The Showdown is Florida’s third-most demanded games this season as games against both LSU ($279) and Alabama ($284) surpass prices for the interstate matchup. 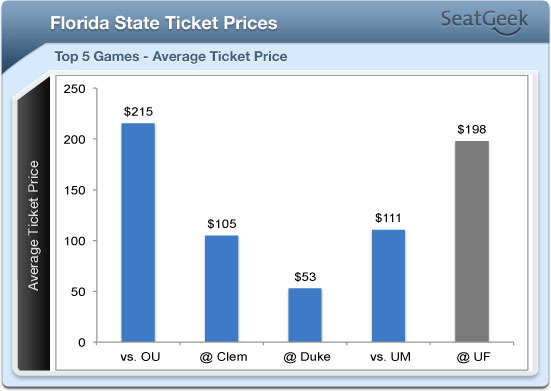 Last year’s Florida-Florida State game in Tallahassee had an average ticket price of $131, making this year’s game 50.38% more expensive to attend. Right now, the least expensive seat currently listed on SeatGeek is for $63 in Section 327 Row 27. 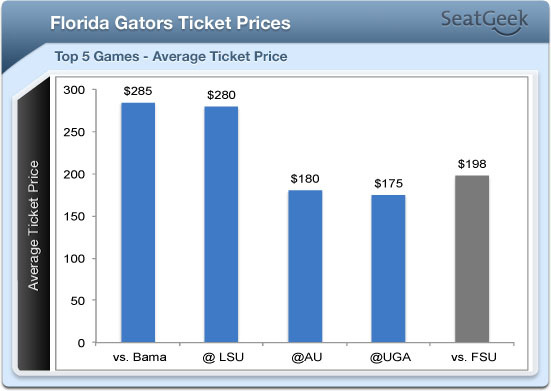 For Florida, the other highest priced games this season are at Auburn ($180) and at Georgia ($174). For Florida State, the other highest priced games this season are vs. Miami ($110), at Clemson ($104) and at Duke ($52).